Once again we were having a few people over and this time they mentioned that they have never tried an eye round cut of beef. So I said bring some red wine over and I’ll show you what to do and we will put it on the rotisserie and enjoy the sun set! So we headed to the kitchen and here is what we did. First, take the meat out of the plastic it’s wrapped in, I like to rinse off the blood, plus it makes it less slippery when you are handling it. Trim off the silver skin but try to leave the fat strip intact. 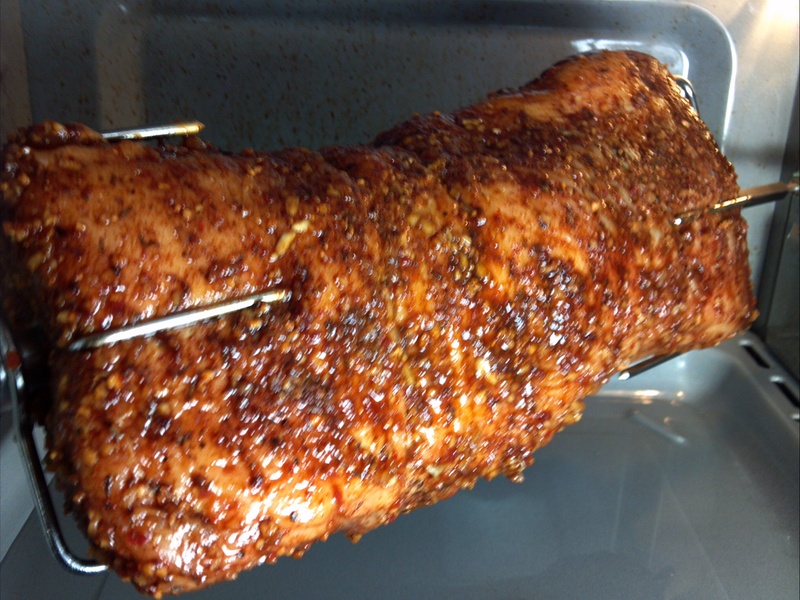 While cooking, the fat will melt and baste the meat as it spins around. Fire up the rotisserie burner, close the lid and preheat the grill for twenty minutes. This is where I cheat a little; I already have marked the rod so I know where the meat should be and I season the meat on the grill because it keeps the mess out of the kitchen and whatever doesn’t stick just falls into the grill anyway. So I rub some oil on the meat, slather on some finely chopped garlic and some Montreal Steak seasoning outside, then check that it spins freely. Forget about it for about an hour. 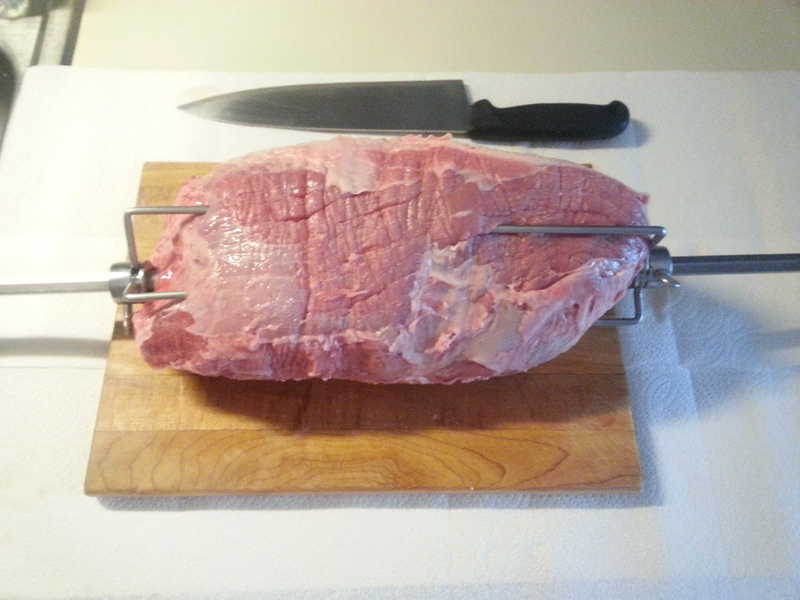 After an hour take a meat thermometer and insert it in the middle of the meat ½ way between the outside and the rod in the center. 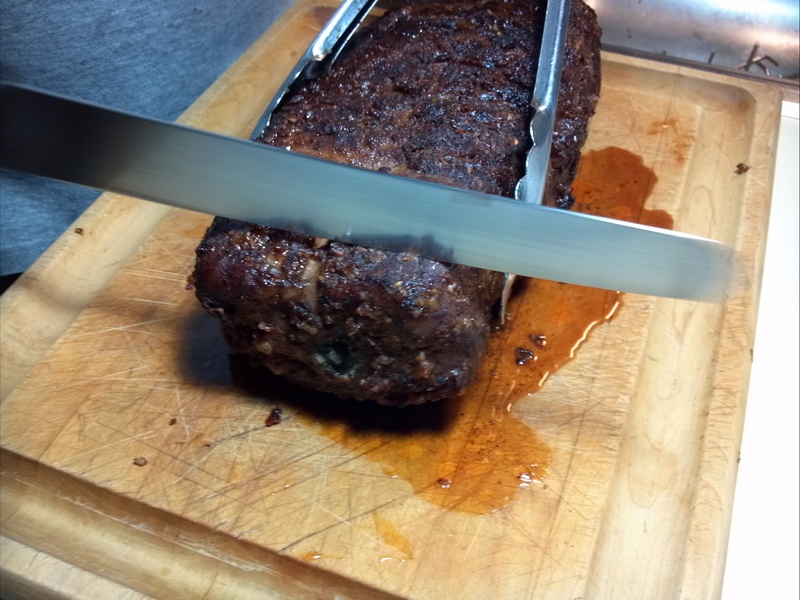 You are looking for about 110F degrees if you like rare meat. 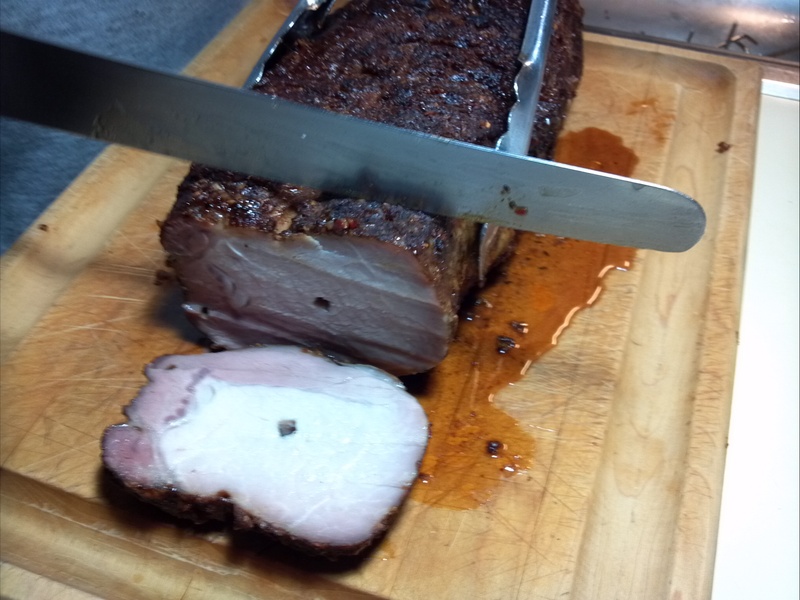 If you test out at 110F turn off the burner but let the meat keep spinning for about 20 minutes. 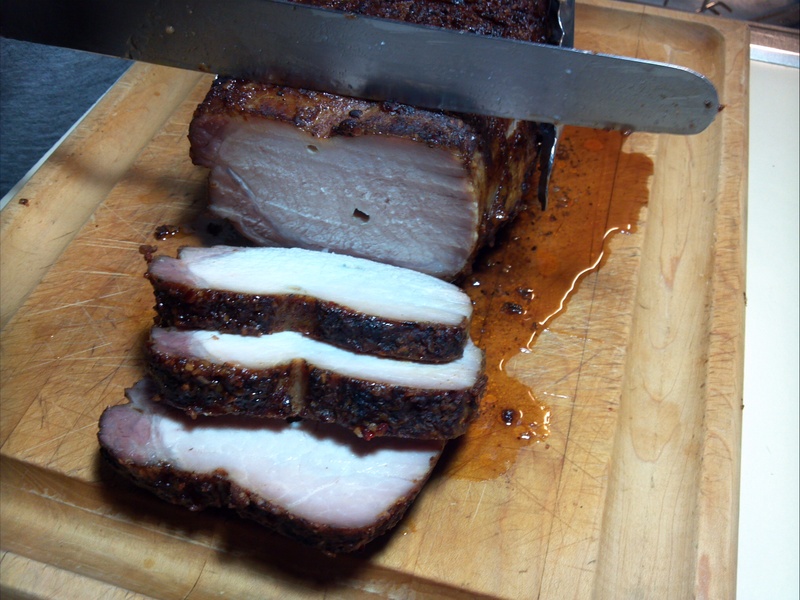 This allows the juices to be reabsorbed back into the meat so when you slice it the juices don’t leak out onto the cutting board. 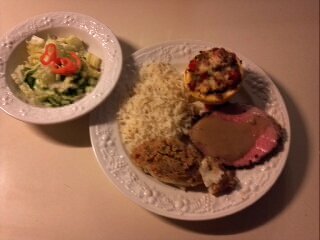 Honestly I think I served the meat with some basmati rice, some grilled vegetables and some fresh homemade horseradish sauce. Good friends, good conversation and good wine led me to forget to take a finished picture after all. Trust me it was delicious! When I make dinner for friends and family, I like do most of the cooking before they even arrive. This allows me to hang out with them instead of being in the kitchen the whole time and at the same time I have some extra time to do something a little extra. The night before dinner with my wife’s family and my father I took five medium summer squash, cut the necks off and then hollowed out the center of them as seen here. 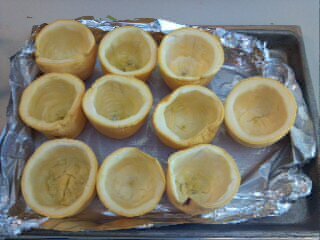 Next the cups were blanched, or placed in boiling water, for about 6 minutes. 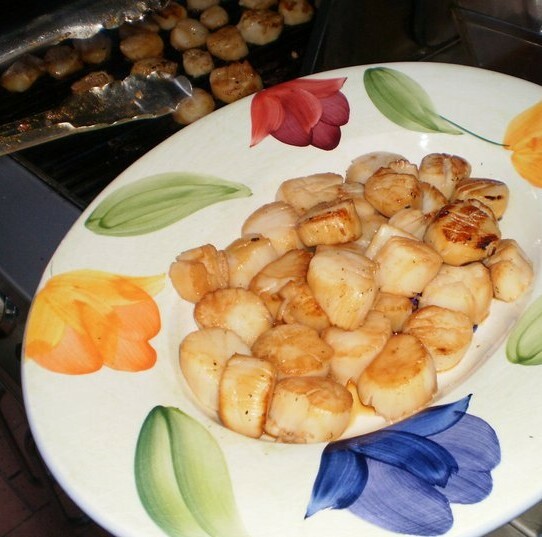 They were then removed and submerged into ice water to stop the cooking process. I placed them on the counter cut side down over some paper towels to remove the excess moisture. 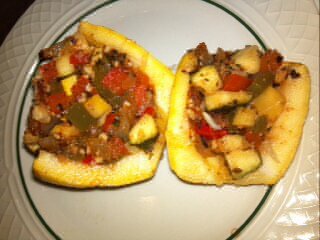 The filling was made using the summer squash from the necks, plus 1 whole summer squash, ½ red onion, ½ white onion, one of each red and green peppers. All of these were finely diced and set aside. In a saute pan I added in Olive Oil along with 1 Tbsp of fresh garlic, 1 tsp of each basil and oregano and a splash of white wine. 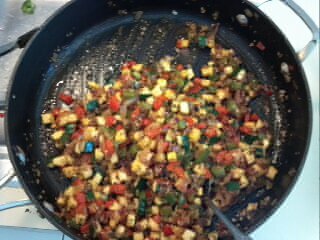 To this I added in the diced vegetables and quickly sauteed them. The mixture is then removed from the head and a handful of halved grape tomatoes is added. 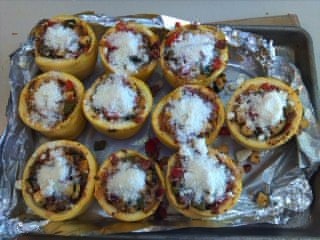 The filling was then placed in the summer squash cups and topped with Parmesan cheese. I then placed the stuffed cups on a platter and covered and refrigerated overnight. Now the stage for the rest of the meal was set around the squash cups and somewhat of an Italian feel.The day of dinner I started with the fish. 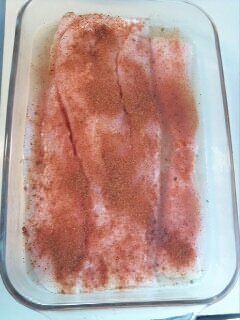 I used Corvina, a relative to Chilean Sea Bass. 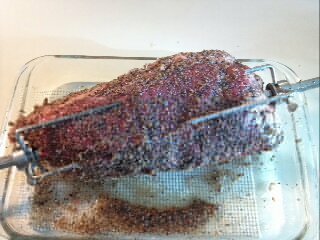 Taking the whole filet, I covered it with a generous helping of the same white wine that was used in the squash cups, sprinkled some Cajun seasoning to give it some zip and topped it with my breadcrumb mix. The breadcrumb mix contains two cups of bread crumbs, ½ cup of melted butter, 3 tbsp fresh parsley and basil and 2 tbsp of dried Italian seasoning mixed together and gently pressed on top of the fish. Next to prep was the beef. For this gathering I choose to do an eye-round on the rotisserie. 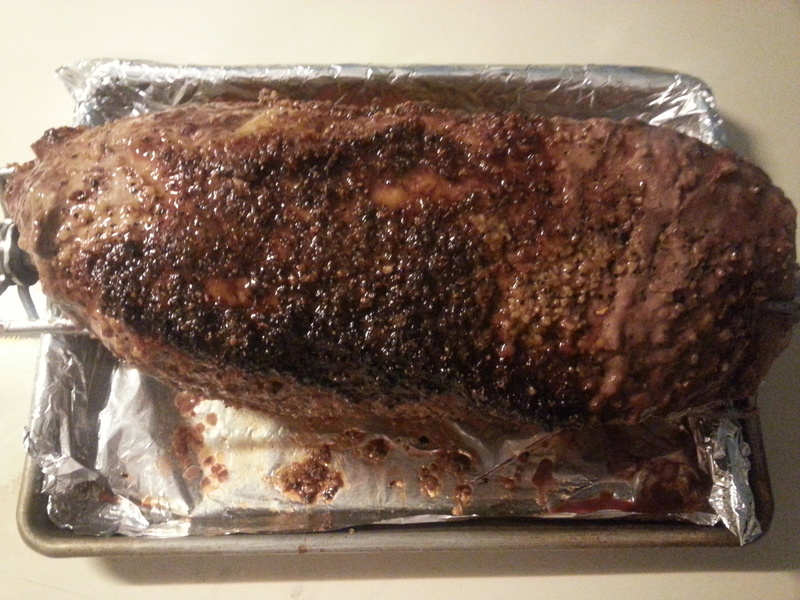 I rubbed the meat with canola oil, salt, pepper and garlic. 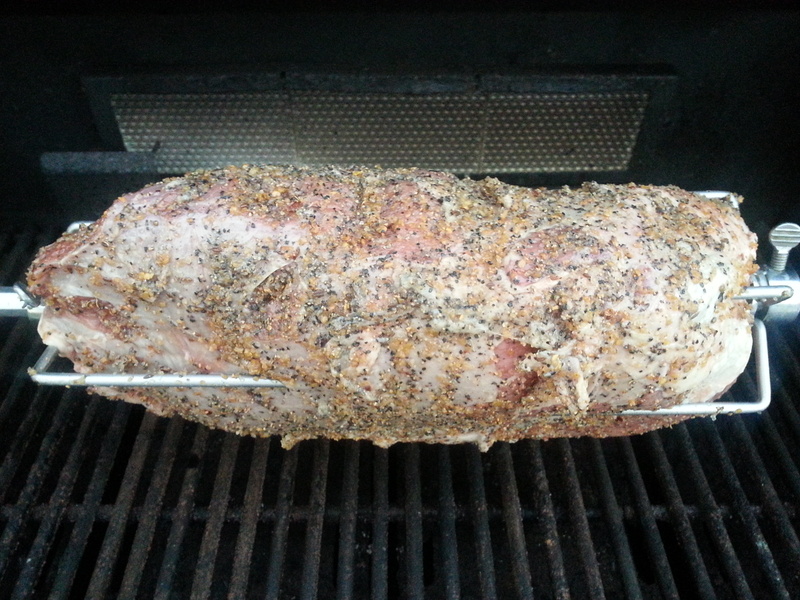 It was then put on the spit, placed on the grill with the rotisserie burner preheated to high. 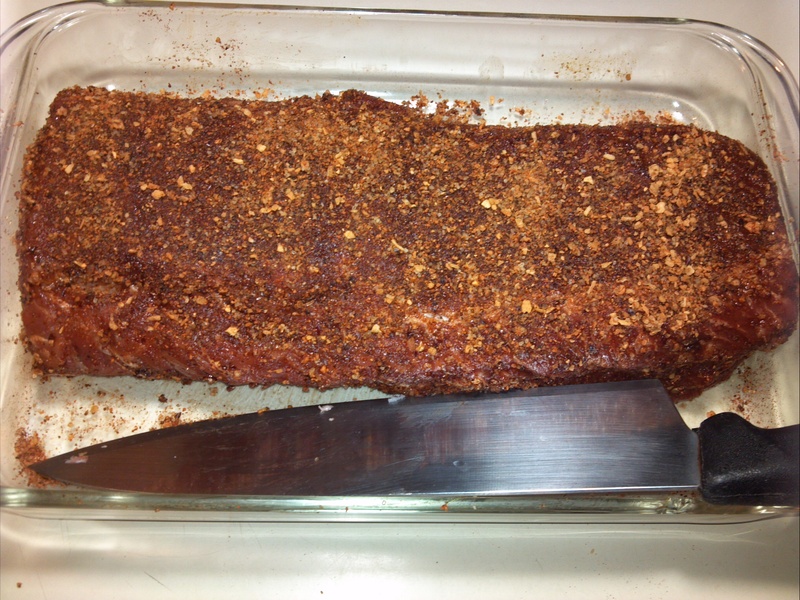 The eye-round cooked for about an hour and a half or until it reached an internal temp of 115F. 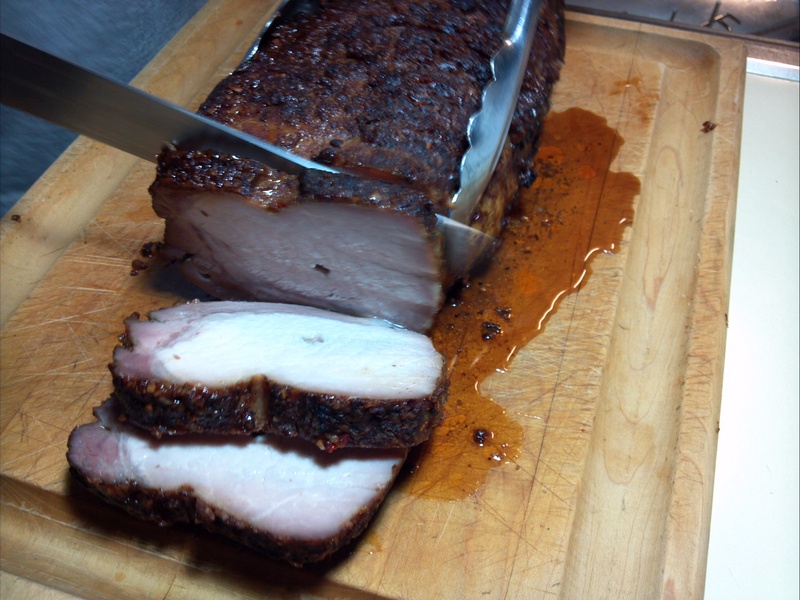 It was then removed from the rotisserie and the spit removed and allowed to rest for about ½ hour. 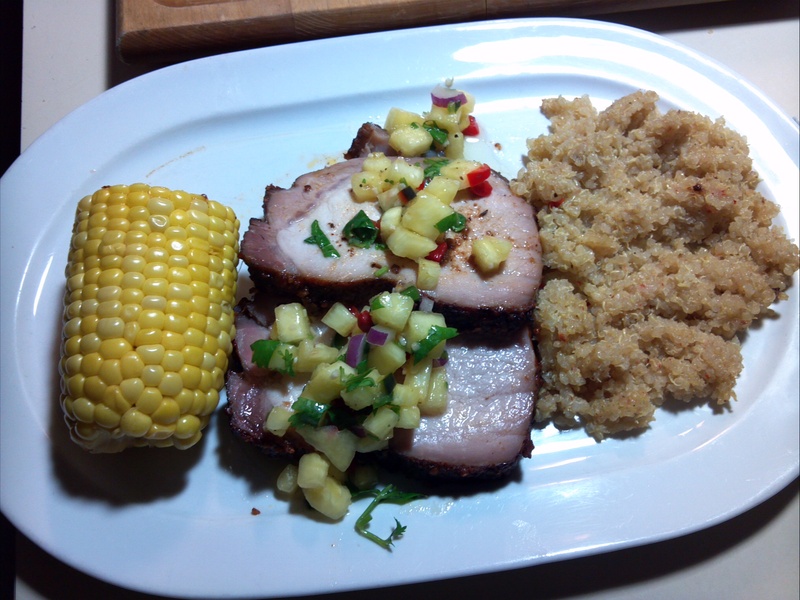 So once the meat was on the grill this gave me about an hour so to finish everything else for dinner. I took out the squash and the fish out of the fridge to let them come to room temp for a little while. In the mean time I made a small little salad, then about 45 minutes before the meat was done I set the oven to 350F to cook the Corvina and summer squash cups. About ½ hour before it was time to eat I put the fish and the squash in the oven, started the rice cooker with Basmati rice, and made a quick sauce for the meat. For the sauce it was really simple, bring 3 cups of water to a boil and add 2 Tbsp of beef base. Once mixed add 2 ounces of Brandy and 4 ounces of heavy cream, cook on low heat for a few minutes. 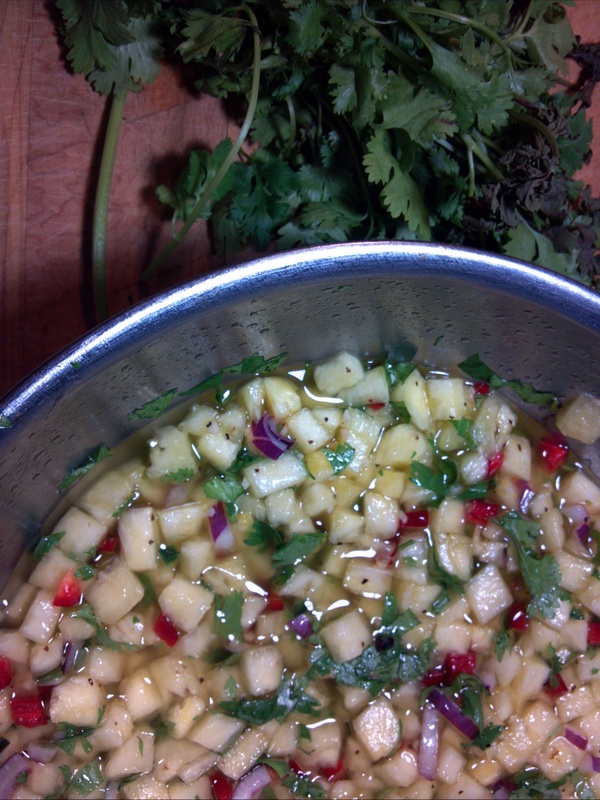 To thicken the sauce add in a roux and leave it on low until its time to serve dinner. To make a roux, mix in a small sauté pan equal parts butter and flour until creamy. 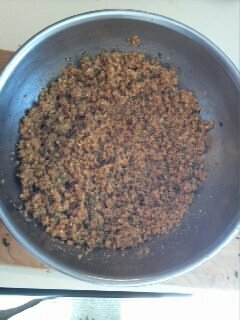 Then about 1-2 tsp of roux is placed into the brandy sauced and stirred until thoroughly mixed. As you can see here is the whole meal on a plate. 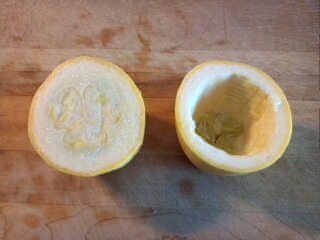 Here is a close up of the squash cups cut in half.